The Sunshine Coast will be opened up to seamless travel from Europe, Asia and America, while offering locals the opportunity to connect directly with a vast number of international flights when Qantas’ new direct morning service from Sydney starts on 1 April. It is the second daily service offered by Qantas and reflects strong growth in demand from business and leisure travellers wanting to fly direct to and from the Sunshine Coast. Sunshine Coast Airport has been the fastest growing airport in Australia, with 43 months of consecutive passenger growth, and year on year average growth of 9%. The new Qantas service will depart Sydney at 10.30am, arriving Sunshine Coast at 12.05pm*, enabling it to connect with 15 Qantas inbound flights that arrive into Sydney from Europe, Asia, America and New Zealand in the early morning. It will allow for single-ticket itineraries to the Sunshine Coast for international visitors. Equally, Sunshine Coast residents will be able to take advantage of the 12.45pm* departure time from Sunshine Coast Airport, arriving in Sydney at 2.30pm to connect with afternoon and evening international flights out of Sydney. “This is a very significant addition to the Sunshine Coast’s flight schedule,” said Sunshine Coast Airport CEO, Andrew Brodie. “Connectivity is key for regional airports and the new service will not only be able to deliver international visitors to our region more efficiently, it will mean that local residents can fly out of their own airport at a convenient time and connect directly to international flights out of Sydney. “As any Sunshine Coast resident knows, the vast amount of road works on the Bruce Highway has meant that travelling to Brisbane for domestic and international flights is often impacted by significant traffic delays and disruptions. The new direct Qantas services will save both time and worry for Sunshine Coast travellers planning overseas travel. “The addition of a second Qantas service highlights the strong demand by business travellers, as the Sunshine Coast becomes an increasingly diverse market, with a rapidly growing business sector. “The most recent National Visitor Survey statistics indicated that domestic business travel to the Sunshine Coast increased by 5.5% in the year to September 2018, while our own annual departing passenger surveys have indicated growth in the percentage of travellers flying for business has increased from 16% in 2017 to 21% in 2019. “This reflects the fact that the Sunshine Coast is now the 10th largest major urban area in Australia and has the second strongest performing economy in Queensland. “Given that there is more than $10 billion committed to public and private investment in the region – including the $305 million new runway project at Sunshine Coast Airport, which is scheduled for completion by the end of 2020 – we expect the level of business travel to rise sharply in years to come. 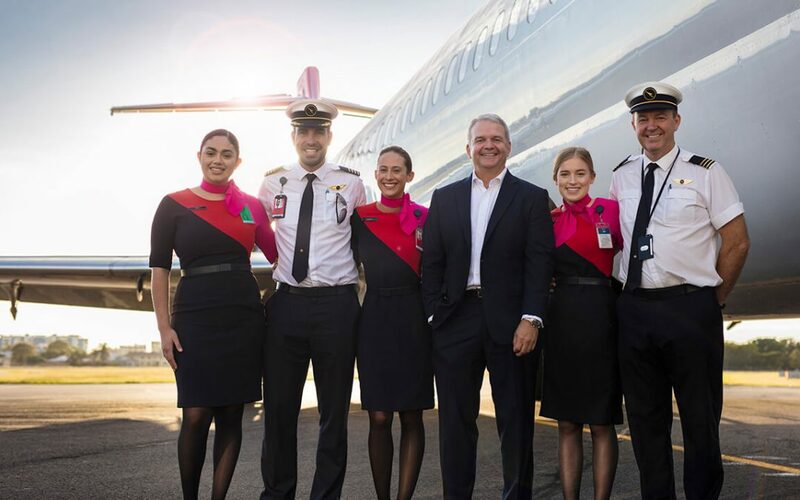 QantasLink CEO John Gissing said the additional flights have been introduced to offer more choice for the growing number of visitors to the Sunshine Coast. “By adding a morning flight to our schedule, we’re helping travellers from Sydney arrive in the Sunshine Coast sooner, whether it’s for business or to unwind on holiday,” Mr Gissing said. “These services also open up more options for overseas visitors who will be able to easily connect to the Sunshine Coast after arriving on international flights in Sydney. By increasing its weekday flights between Sydney and the Sunshine Coast from daily to double daily, Qantas’ total weekly return flights will increase from eight to 13, adding more than 550 seats on the route in each direction each week. Flights will be operated by 110-seat Boeing 717 aircraft which include a Business cabin. * From launch on 1 April through to 7 April 2019, daylight savings time will apply, with flights departing Sydney 10.30am, arriving Sunshine Coast at 11.05am, and departing Sunshine Coast at 11.45am, arriving in Sydney at 2.30pm.